This is another tutorial that I am updating to work in my new blog format, I first published it on my blog in January 2009. This is a great technique that can be used by any child over about 4 – with some help for the younger ones from an adult. There are lots of steps that children will love, like scrunching up the newspaper and slapping on a ton of glue. I call it cheat’s paper maché because you don’t have to build up layers and layers of paper which can get tedious and boring for kids. You skip pretty quickly to the fun part: decorating. In my tutorial I use fabric for the outer layer because it gives you lots of options with colour and pattern and is pliable and easier to work with than paper. 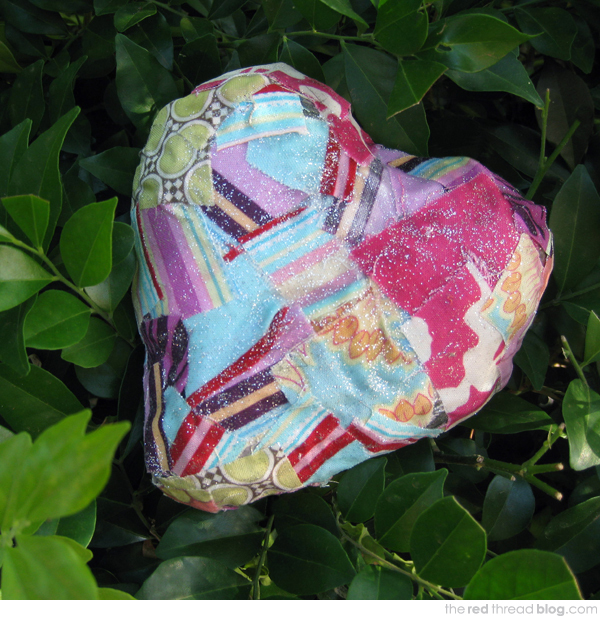 And it’s a great way to use up your fabric scraps. Click on the ‘read more’ button below for the full tutorial. Start by cutting your fabric into small pieces – roughly about 2-3cm (I inch) square. If your child is making something quite small like a mouse, the size of the fabric pieces will have to be smaller too. Decide what shape you wish to make. 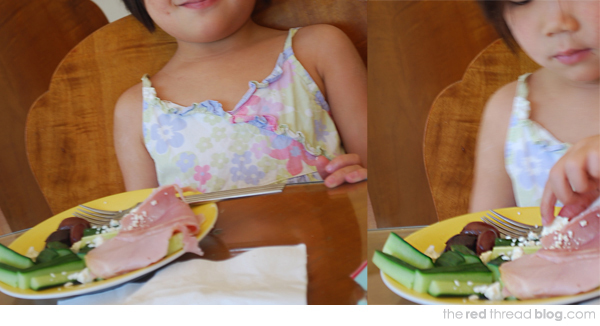 It can be anything: an animal, a mushroom, cupcake, car… the younger your child the simpler the shape should be. Roxy made her first one at 4 and a simple mouse made from a single ball was perfect. This time she chose to make a heart, and I made a babushka. Start off with a simple shape and graduate to something more complicated after you’ve had some practice. Cut a tabloid newspaper page in quarters. (The size of your paper will depend on the size you’d like your finished piece to be.) Take one of the quarter pages and scrunch it up in a ball. Flatten it out again and then scrunch it up again. Do this a number of times until your paper softens. Finish with it rolled up in a ball. Decide how many balls to make and what size they should be to suit your project. For Roxy’s heart she needed two large balls and one smaller one. Cut a piece of newspaper that is big enough to wrap one of the balls up. Soften it by scrunching and flattening as before. 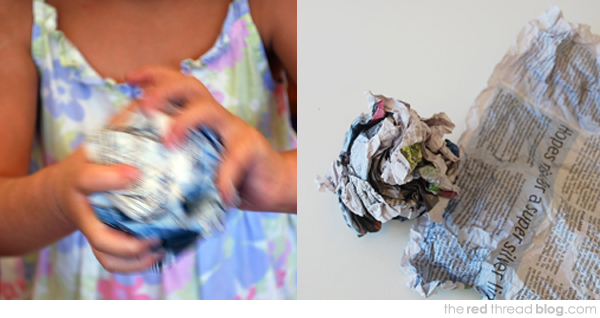 Wrap the ball up in this piece of newspaper, squeeze the ball tightly as you are wrapping so it’s pretty solid. Your aim is to have a smooth round ball, so wrap fairly neatly. Use the sticky tape to secure your wrapped ball so it is smooth. Repeat steps 3 & 4 for all the balls/shapes. For the heart we made the 3rd (smaller) ball into a cone shape when it was wrapped. It will form the bottom of the heart. Join all your wrapped pieces together with sticky tape to form the shape of your object. Decide whether you need to fill any gaps. For the heart we wrapped a long piece of scrunched newspaper around the middle and secured it with tape. Cut a piece of newspaper large enough to cover your finished shape and repeat the scrunching and flattening, wrapping and securing process (as before). Now all your original pieces should be combined to form the finished shape ready for decorating. Stop for lunch and a run around… It’s hard work this crafting! Cover your work surface with newspaper or a plastic sheet. Paint one side of the shape with lots of glue. Place the fabric pieces on, overlapping them and painting glue over the top. The glue dries clear and the finished piece is stronger if it has more glue on it, so apply it fairly liberally. Roxy wanted to use glitter glue, which really added something extra (lots of sparkles!) to her finished heart. Let that side dry before you flip it over. Time for another race around while it’s drying. You can add detail like I did with the babushka by cutting shapes out of fabric – face, hair, eyes, etc – and adding them last. Set your finished piece aside to dry completely. I love doing this as much as children seem to! It’s so much fun and the results are only limited by your imagination. You could make Christmas ornaments using this tutorial. To hang the ornament secure a loop of ribbon to the newspaper shape before you stick on the fabric. Handmade hearts would also be nice for Valentine’s Day, or smaller ones would be lovely for an extra personal touch when wrapping birthday presents.